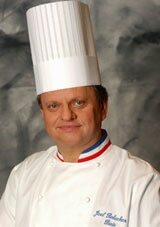 Robuchon is one of the few who made contemporary gastronomy what it is today. Were we to compare cooking to painting, he would be one of the very first impressionists, a Manet of the ovens. When Robuchon opened the cozy but smallish Jamin in the 16th arrondissement of Paris in 1982, he immediately earned, without even asking, an 18/20 rating from GaultMillau/Gayot. We are glad to bestow on Robuchon his first 19/20 rating in America for his fantastic endeavor at the MGM Grand Hotel & Casino.